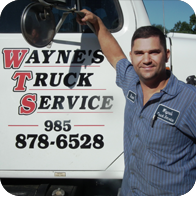 Since 1983, Wayne's Truck Services has offered full service diagnostics and repairs for all makes and models of diesel trucks and engines. With cutting edge technology, but down-home friendly service, we are able to troubleshoot and repair even the latest models at the shop, on the road or at your facility. At Wayne's, we provide maintenance for fleets or independent drivers and specialize in major overhauls when you need it. With over 75 years of combined experience with certified mechanics, let Wayne's Truck Service keep your trucks at peak performance and on the road.